The conference was attended by all eleven member countries: China, India, Indonesia, Japan, Republic of Korea, Malaysia, Mongolia, the Philippines, Singapore, Thailand and Vietnam. Upon commencement of the conference, a keynote speech on the subject of “Grooming Scientific Talent in Asia” was presented by Mr. Lim Chuan Poh, Chairman of A*STAR. At the General Assembly I on 17 June, two progress reports of the SCA Joint Projects were presented; “Open Data and Knowledge Environment for Innovative Research on Poverty Free and Ecosystem Protection in Asia (ODKE)” by Prof. Liu Chuang, China Association for Science and Technology (CAST), China and “Sustainability Science for Sustainability Governance: A Study on science - governance symbioses” by Ms. Sarah Aziz Abdul Ghani Aziz, Institute of Environment and Development (LESTARI), Malaysia. 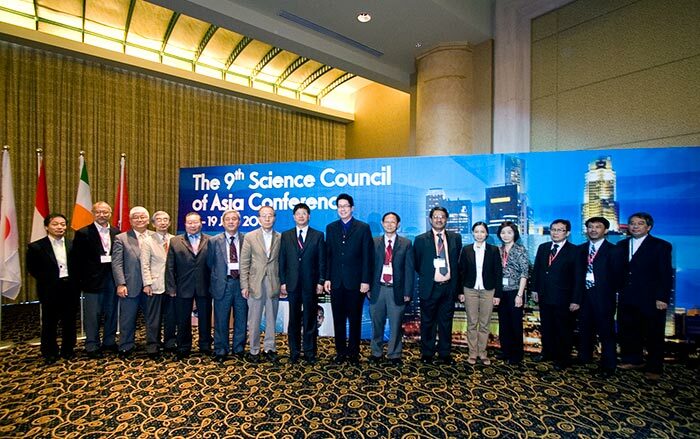 On 18 June, The First Meeting of New Framework Examination Committee (NFEC), which was derived from the approval of the First Strategic Plan of the Science Council of Asia in 2008, was convened and chaired by Prof. Hong Wanjin, Deputy Director of Institute of Molecular and Cell Biology (IMCB) of A*STAR, Singapore. Of the SCA Joint Projects, six projects, namely, “Water”, “Natural Disasters”, “Gender”, “Ocean Security in Asia”, “Honeybees” and “Space and Lithosphere Environment” held individual sessions on 18 June. The SCA Special Sessions, “Pop Culture in Asia: Families in the Films of Asia” and “Grooming Science and Technology Talent”, were held in parallel on the same day.